Netherlands-based company Verachtert has become a market leader for work tools, for all types of excavators and wheel loaders. It also offers a wide variety of grabs. The company has been in business for 60 years, and in that time, it has gained a reputation for reliability, innovation and customization, and for always putting the customer first. What sets Verachtert apart from many other companies is its dedication to the needs of the customer. Its strength lies in getting to know the customer’s application, and making the best tool for the job. Many of its products are custom-made, ensuring that productivity and efficiency are maximized. The company’s products are used daily and intensively by a large group of international customers in earth moving, road and water engineering, demolition, scrap metal processing, recycling, construction, demolition, scrap processing, industry and transshipment. Verachtert assembles its products itself, using parts that are manufactured out-of-house. In this way, it is able to implement strict quality control measures, and also to focus its expertise on the development of the equipment it sells. Of particular interest to the bulk and breakbulk industry are Verachtert’s wheel loader attachments, as well as its grabs. In ports, its wheel loader attachments are widely used by very large coal and ore handling companies. The attachments are employed in ships’ holds, on the quay and in the stockyard, and are widely used to load trains as well as to move piles of material around the premises of the customer. Verachtert has designed very large coal buckets which are comparatively light. 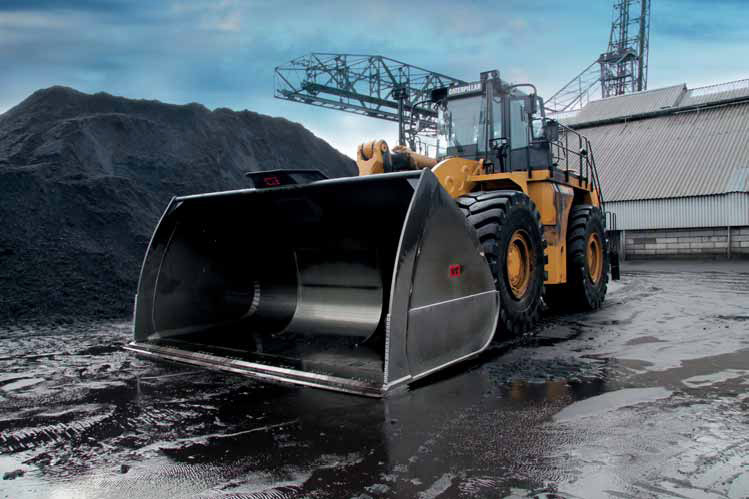 It is therefore possible to attach larger buckets to wheel loaders, and to carry greater volumes of coal, significantly increasing the customer’s productivity. This also fits in with Verachtert’s focus on ‘green’ production — the lighter the bucket, the larger it can be, and less fuel overall is consumed. The smart design of the buckets, and the attention paid to the way material enters the buckets, also serve to strengthen their productivity, and to reduce the customer’s CO2 footprint. Verachtert strives to put intelligence into all its products, to maximize their potential in every way. It is constantly looking to find ways to improve its equipment — to search for innovation; to try and make the products lighter, simpler and more efficient. It looks closely at daily operations, and tries to position the component parts in a piece of equipment so that it can reduce welding if necessary, make the construction strong but also light, and to make important components accessible. All of this is done with the needs of the customer in mind. Verachtert specializes in selling and renting new and used work tools. It also offers service and repair services, and holds a large stock of spare parts — most of which it can ship to the customer within 24 hours. The product range includes quick couplers, buckets for excavators and wheel loaders, grabs and demolition tools including shears and hammers. Verachtert’s work tools all come with an extensive service package containing everything, from advice in selecting the right equipment to after- sales and support in maintenance and repairs. It has an excellent workshop maintenance and repair facility, and also has field mechanics that it can send out to the customer’s site if necessary. Verachtert has a strong position within the European market, strengthened by being located in the Netherlands. It aims to maintain and increase its position in Europe. Its philosophy is one of long-term relationships with customers, evidenced by the many repeat orders that it receives from long-standing clients. It has the same approach to its suppliers — longer relationships and trust lead to better results all round. The acquisition in January 2013 of DCC-Grabs (see box, above) has helped Verachtert increase its presence in the local and the global markets. Recently, the company has won business in Africa and in the rest of Europe. Verachtert is ambitious — it wants to have a wider range, not just of products but also in terms of the geography of its customers. Verachtert has been able to face out the global economic crisis by continuing to offer a strong, stable service to its customers. It knows the importance of reliability, good service and honesty. It hopes to benefit from the recent improvements in the global economy, and views the future with cautious optimism. It is always working on new markets, and has recently moved into the harbour cranes arena. It plans to remain innovative in its approach, and to continue to look at new grounds and innovation.